What is our go-to keyword research tool? How often do you re-optimize your listing? How to deal with hijackers? 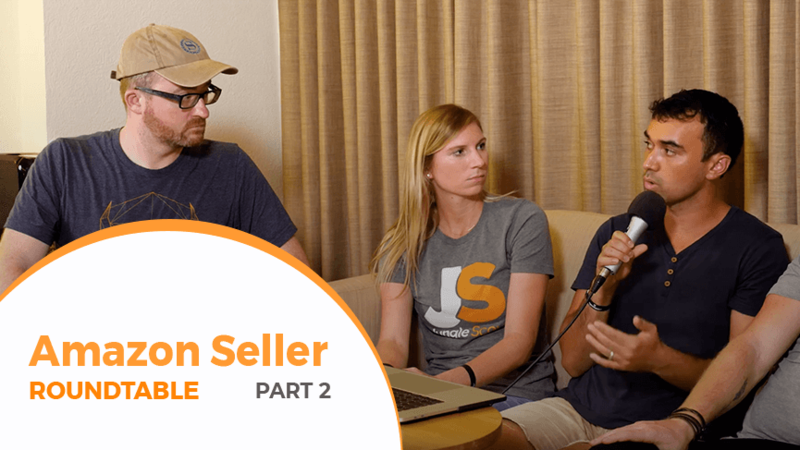 We’re covering all of this today in Part 2 of this 2 Part series of the Seller Roundtable: Jungle Camp Edition. Watch the video, keep reading and don’t forget to subscribe to our YouTube channel so you never miss a video update! Welcome back to Seller Roundtable: Jungle Camp Edition! Today’s blog post is Part 2 of a 2 Part series of this special Jungle Camp edition of Seller Roundtable. Jungle Camp is a bi-annual event at Jungle Scout where we get the entire team together to work and play. What else can we do to optimize our listing? Ervin: I definitely want to drill down on the importance of keywords just because Amazon is a search engine first and foremost. And so, in order for customers to find their products, we must tell Amazon what the product is all about. So, when we initially launch our products, Amazon actually indexes their products beforehand for all the keywords that we have on our title and on the backend. Recently it was discovered that the field on the backend called “Subject Matter” is also being indexed by Amazon. It’s really important that we maximize the use of keywords we have. And in terms of the weight where Amazon indexes your listing, they look at the title first, then they look at your backend keywords. Then, they look at your bullets, and lastly your description. Dave: Amazon rewards relevant stuff by pushing you up in rankings. The further up you go in rankings, the lower your costs are going to be, and the higher your sales are going to be. So, to really optimize your listing you need to make sure that you’re title has relevant stuff in it. If your a garlic press, that’s gotta be the first words there. I’m a garlic press. Carrie: I definitely agree relevancy is huge. Because, what I’ve seen a lot is, people just stuffing a lot of different keywords, and so, you’re not only optimizing for the Amazon search engine, but you’re optimizing for a customer as well. So you can’t just have a title that’s just really a bunch of keywords stuffed in there with your brand name. Because, people are reading this, and these people are the ones who are going to actually click “add to cart”. So, you’ve got to appeal to them as well. So, it’s a really a fine dance between optimizing for the Amazon search engine, as well as for the customer. What is your go-to keyword research tool? Elizabeth: Keyword Scout for me is the best one because it uses Amazon data versus external data. What I do is I use the top keywords and then I actually put that into a spreadsheet. I sort from most used keywords to least used keywords, and then I kind of sit there and I do the dance. How can I make my title sound like it’s a title but also use all use these top keywords, so I will draw a line in the sand and say the top 15 keywords, okay? Using those top 15 keywords, how do I get all of those into my title within the allowed character count. Ervin: Totally, Keyword Scout is awesome and I use it for every product launch, but something that I also like to leverage and use on top of that would be my customer search term reports on PPC, because now we’re not only relying on the search volume with the most searched keywords on Amazon but the customers that have bought our product, we will be able to find these keywords that they use and how many times they’ve ordered using that keyword for our product. So optimization doesn’t really have to stop once you create your listing, but it’s an ongoing movement and I like to integrate those keywords that I find on my search term reports onto my listing and even maybe test them using Splitly just to make sure that I’ve got the right title, I’ve got the right copy and I can squeeze as much money as possible from Amazon and my customers. Carrie: Another thing to add to that. I actually use the Chrome extension tool to search top salespeople within whatever my niche is and steal keywords from that. Dave: To make that process easier, you can take their ASIN, you can put it into Keyword Scout and it will take all the keywords that they’re ranking in the top 10 for and spell it out. So you have their exact keyword strategy right there in front of you. How often do you re-optimize your listings? Elizabeth: I re-optimize every 30 days to make sure. Dave: This is something a little bit more advanced, but you can A/B test a lot of stuff and you can perform different tests with different pages just to see which does better, which does worse. If you’re afraid of changing something and erasing all of your hard work, don’t worry. We’ve got you covered. We use a tool called Splitly, it does it all for you automated. It’s all machine learning. You just go, this is what I want and a week later it says, “hey this is what we got back” and then you can really make this decision without screwing up all your hard work. Elizabeth: And so many times it’s the opposite of what you think it is. “Oh, this picture is definitely going to win” and then it’s the other picture, the one that’s not as good as the one you think it is. Has anyone gone through the experience of getting a trademark and getting Brand Registered? Carrie: Yes. Definitely, there is a new way to get Brand Registered. You use to be able to get it without a trademark, which was a lot easier but now you have to be trademarked. So you will want to contact a lawyer and there is a lawyer on the Jungle Market that actually will do it for you. So getting your trademark, you can get it for about $300 dollars and that $300 dollars is just going to be returned to you so much quicker because you’re going have access to Enhanced Brand Content, Amazon Stores, and you’re going to be able to create a brand and tell a brand story, that you wouldn’t be able to tell otherwise. Dave: What I did and I think a lot of people do is they kind of just test the water first to see, hey is this brand and this product going to work? And then, when you see that it’s really working and you already are thinking about product number two, then you can go ahead and pull the trigger. Yeah, you won’t get the Enhanced Brand Content, which is really awesome and it definitely helps your conversion rate but Amazon’s not going to treat you any worse than the next seller. Lenny: Yeah, I’d say that too. We all know that Enhanced Brand Content looks amazing and it helps to convert and so forth, but I sort of believe that it is the future of selling on Amazon. I think Amazon is just going to roll out more and more features and people that have brand registry are going to have a leg up. Carrie: Amazon Stores is kind of like your own website within Amazon. It’s templated like Enhanced Brand Content so you can create pages. It’s really not hard to do which is really cool because you can click and drag and add in photos. You can add in video and you can literally put all of your products, you can even do different pages on a per category basis. I think the best part of it too is that you can just really brand yourself and that really helps build a connection with the customer and build customer loyalty. And it’s not hard to do just because I think the templates that they put on there are really easy to work with. I love Amazon Stores. Do you need a trademark for Amazon Stores? Carrie: Yes, you do need a trademark for Amazon Stores so again, just like Lenny was saying, they’re probably going to keep rolling out cool things for Amazon Stores and Enhanced Brand Content that’s only going to be available to a registered brand so you want to really get on that as soon as you can. Has anyone had any experience with hijackers and stuff? Dave: Yeah Jungle Stix got hijacked. Lenny: Really? I didn’t know that. Dave: Yeah right before the fourth of July. So what happened was we ran out of inventory and the way people are doing it is their essentially just searching for people whose products have run out. They’re jumping on the listing and then they’re sending other products, essentially drop-shipping them. The way we dealt with this is we sent some letters saying, hey this is a trademarked brand, Amazon frowns on IP violations, don’t do this. The best way to combat hijackers these days is to keep your products in stock. Check Forcastly and make sure your stuff’s good and also make sure that your pictures are solid. Make sure your brand is nice and clear because if hijackers are sending stuff that’s not your product, you can buy your own products and then do an A to Z violation on them and say, hey these people are messing with my stuff. Elizabeth: So if I remember correctly the stat, it is around 80% viewed the listing on their phone at some point before they purchased. So whether they’re researching and they purchase on a desktop, or whether they are purchasing on the desktop and then they try to pull it up on their phone at a later date, they’re using their smartphone 80% of the time. Anytime they want to look at Amazon or buy through Amazon. So making sure that your listing is optimized for mobile is so incredibly important. Just pull up each and every listing that you have and look at them on a mobile device. How does your Enhanced Brand Content look? Does it look off? Does it look wonky? Is your text too large and then it becomes too small? Is your photo off-center? How does it actually look on a smartphone? How does it look on an iPad? And then how does it look on a desktop? Making sure you cover all those bases. Ervin: Also, one thing about mobile is when you look at your listing on the mobile, it actually displays differently, like you said, instead of your description coming last or EBC coming last, it actually comes first before your bullet points but something about your bullet points as well, only the first three bullet points of your listing appear instead of all five. So you want to make sure that in case someone looks at the bullet points, you want to make sure that you put all of the most important things about your product on the first three bullet points and then if they want to click that, then they would expand but I’m interested to see how many percents of Amazon’s customers actually click on the bullet points to expand the selection and display all five. Which we can probably say it’s a few. Is there a way to outsource this work? Carrie: Absolutely! If you go to the Jungle Market, there are people who have been pre-vetted, who can do Enhanced Brand Content for you. Again, you’re going to want to give them direction on your brand and give them the vision of what you’re looking for and they can create it for you. Lenny: Awesome guys so I think we’ve covered a lot in this Sellers Roundtable series. Everything from giveaways to EBC, chat bullets, optimizing a listing, brand registry, early reviewer program, optimizing for mobile, storage fees, and hijackers.